Sprinkled With Love BOM - Precut & Pre-fused Applique! Programs - Most Include Backing! > Sprinkled With Love BOM - Precut & Pre-fused Applique! This is one of our Quilt Market finds! This seven-segment program is now Back in Stock! Yeah! Kits are limited, so reserve your space now! Your reservation pays for your final kit! Finished Size: 58" x 70"
Includes precut and pre-fused appliqué pieces, background & binding fabrics, patterns, fabric accessory pack, custom button pack and ric rac. 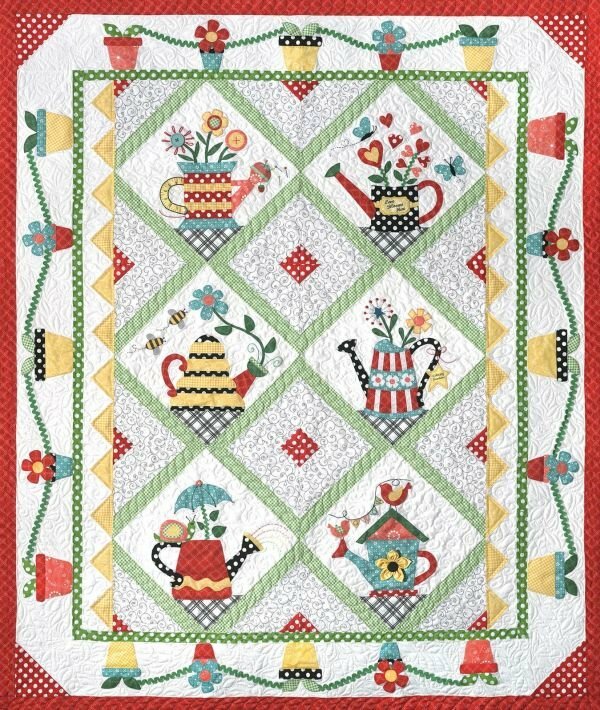 Sprinkled with Love is a happy, fun garden theme block of the month quilt! Each of the 6 watering cans has its own personality. "Stitchin' & Sowin" has a Spoll of Thread Watering Can with a Tape Measure handle! 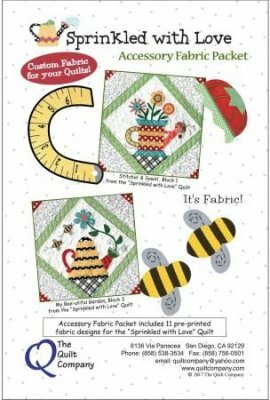 "My Bee-utiful Garden" hads bumble bee fabric that is part of the Accessory Fabric Packet! Kimberbell Basics from Maywood add such fun with polka dots, plaids and prints. And there is a jam packed Button Packet that is included as well! This program starts anytime you wish! Backing is not included with this program, but will require 3 3/4 yards of coordinating 45" fabric or 1 7/8 yards of 108" wide backing. Here is a link to a variety of Red & White fabrics.